We have a very dear friend who is from Sweden – every year he hosts a party and one of the starters is always cured salmon. He orders a whole Norwegian salmon from Seafood On Sail and prepares it. As he tells it, gravad means grave and lax is salmon. The salmon would traditionally be covered with salt and buried in the ground, underneath the snow until cured. We however, don’t have snow low enough, or often enough for that method! 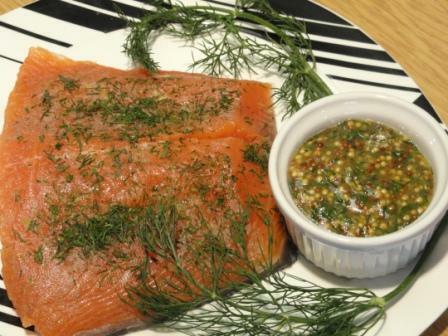 But, this recipe for Gravadlax is perfect and easy to do. I have never cured a salmon before – it sounds fabulous and the sauce equally as fabulous.